Premier Wen Jiabao said, recalling his visit to Hebei a month ago, to a panel discussion with the delegation from Hebei province during the NPC session on Wednesday morning, . "When too many departments have the authority to supervise something, the result is usually no supervision at all." Chen Xiao'en, a high-ranking official from Zhejiang province and an NPC deputy, blamed multiple supervising agencies as the reason for the rising number of food safety scandals in China. "It is true that workers are relatively underpaid. The reason for this may be that they need to negotiate their wages as a group." Zhang Mingqi, vice-chairman of the All-China Federation of Trade Unions, agreed with a motion submitted by the Jiu San Society, one of China's eight non-Communist parties, which aims to establish a mechanism for the collective bargaining of wages. "As a deputy to the National People's Congress, I don't even know where I can report problems." Zhong Nanshan, a Guangdong-based doctor and prominent figure in the fight against SARS and the H1N1 influenza, recommended strengthening the deputy's role in legislation and supervision during the Guangdong delegation's group discussion on Wednesday. "Sports programs are my favorite. I like to watch basketball and football games, especially the European Football Championship." 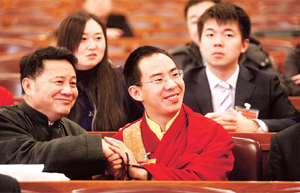 Palma Trily, a veteran soldier and chairman of the Tibet autonomous region, comments on his personal life. "There were 11,669 cases last year whose verdicts were overturned because the original ones were wrong, comprising about 0.18 percent of all the valid sentences." Wang Shengjun, president of the Supreme People's Court, said in his work report at the NPC session on Thursday.